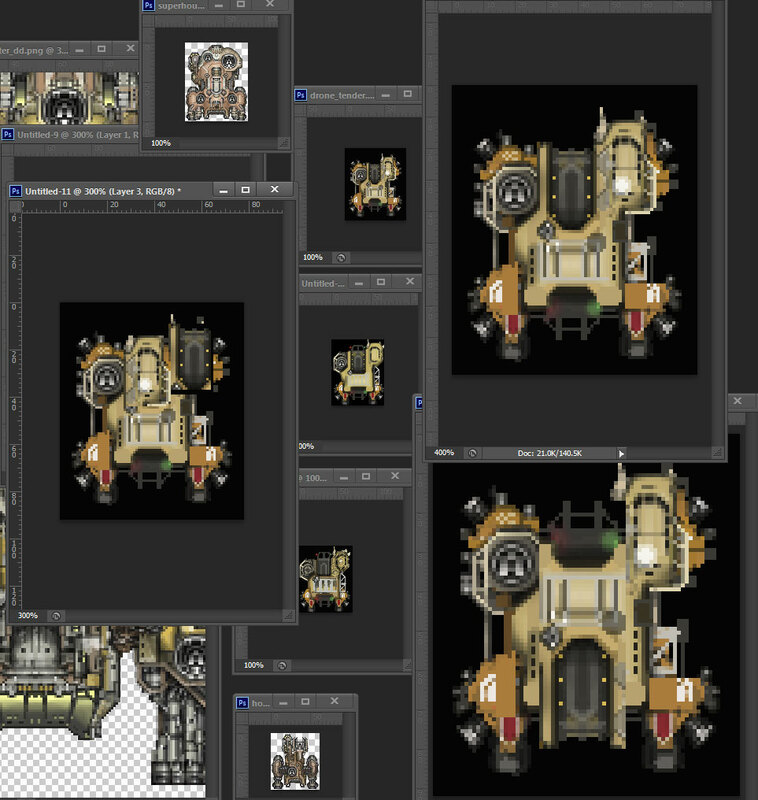 Due to popular demand I’m going to give a go at documenting the process of drawing a ship sprite for Starsector. Haven’t made many new ships lately as there are very interesting larger-scale developments going on, but I find that drawing spaceships is always nice to revisit. And about time I do this again since my methods have certainly changed since the early days. So what kind of ship shall we draw today? Nothing too big as I ought to finish this post in a timely manner, so let’s go with a frigate. And lately I’ve been more excited about ships that blur the line between civilian and military which evoke a sort of post-apocalyptic can-do spirit so this one won’t be a sleek high-end Tritachyon thing. In fact, I’ve got a good weird idea in mind to fill an unfilled niche: a tiny frigate-sized carrier! This would fit nicely as well with some of the setting development we’ve been up to ( “very interesting larger-scale developments” ): one of the new systems going in — Magec — is composed largely of a giant ring of asteroids, dust, ice, and general chaos swirling around a young blue star. There’s a significant planet, but civilization has collapsed and no major faction has stepped in to take responsibility for what’s left. As one might imagine the place is lousy with pirates, profiteers, mercenaries, and adventurers. A combat-converted miner drone-tender would fit in perfectly! So let’s get some inspiration. Now the existing Starsector ship I’d like to reference is the Venture as it’s colourful and grungy, boxy but with attitude. And what’s the real-life equivalent of our frigate anyway? Maybe a seaplane tender, maybe a ship that deploys a submersible. A bit of googling about found some neat photos of interesting shapes, patterns, and colours, some of which are more about the submersibles themselves, but that’s fine. I like the bright, warm colours with dark trusses, frames, and mechanical arms. Very utilitarian, all function over form. 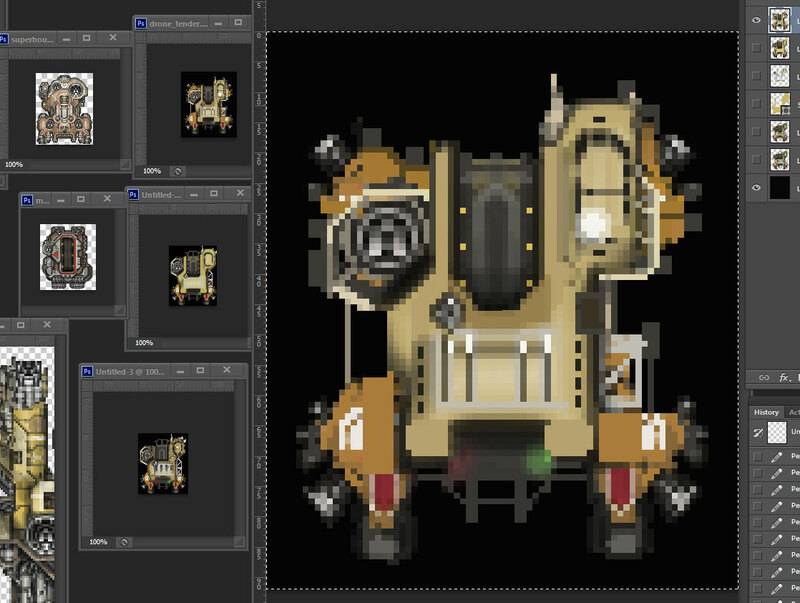 I’ll also pull up some thematically related Starsector ships to keep the style sorta consistent. 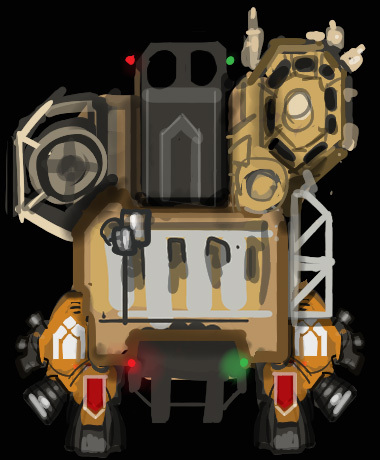 So there’s the Venture, the Mule (similar style), the unused munitions frigate (basically a 1-slot frigate carrier for some mechanics that Alex never went for, as it was turning Starsector into an RTS), and how about the Hound to be our lovable mascot. These also give a sense of scale — I’ll aim for something a bit bulkier than average, around the size of the munitions frigate. We’re ready to rock. Got some nice music on? Good. 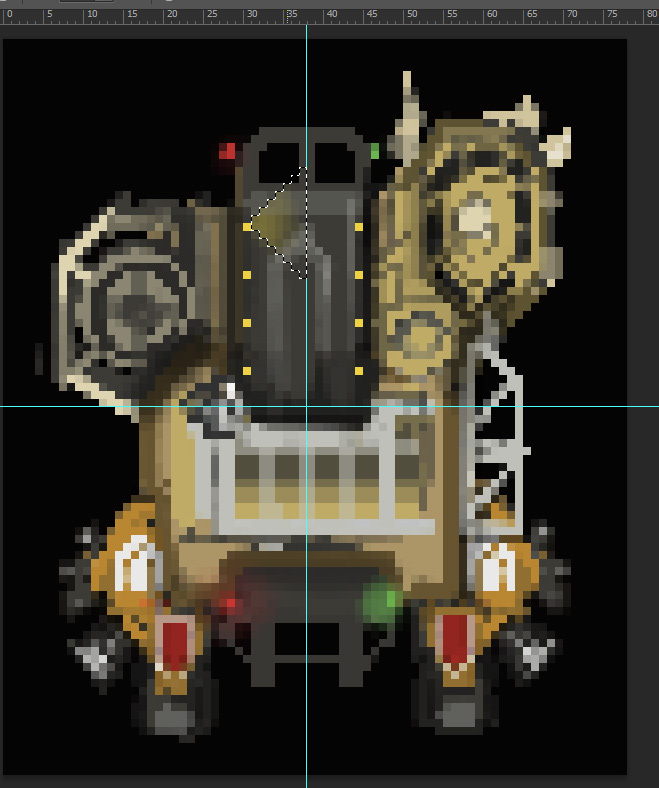 Actually, I’m going to paint this thing out then shrink it down to pixel size. Seems like the right thing to do. I figure it’s got a weapon mount welded on the side, probably a later addition to discourage amateurs and boarding parties but not enough for any kind of stand-up fight. Ballistic for sure, low tech and reliable. The engines are weak, dominated by maneuvering pods; this ship was made to skirt around asteroids and wrecks, probably has good agility but has poor acceleration and, in game terms, unimpressive top speed. Has a roomy bridge with wide viewing arc to oversee operations, fairly comfortable, probably has a zero-g coffee machine (a vacuum coffee maker, naturally) built in, but the civilian outlook compromises its ability to take damage. Sure there’s some up-armouring welded on and painted with some cool patterns, but the underlying structure simply wasn’t built to stand up to anything worse than a botched docking maneuver or stray rock. Wondering if this would be too strong as a dirt-cheap one-slot carrier kept in the absolute back of a battle that can actually field torpedo bombers. Maybe it’d be a special case frigate that conveys its mini-carrier theme using a low-grade deployable drone special system. That could be cool too. We’ll see how it holds up in field testing. I didn’t say it had to be pretty – this is a sketch that only I or Alex will ever usually see. Cool. Let’s push that down to target size using ‘nearest neighbour’ to get some nice hard pixels going on and see how it looks with its friends. Not bad. Scale of the windows/cockpit is a bit big, almost the size of the Venture’s bridge, but I can make that work. Will also need to compare that flight deck to some of the other carriers to make sure everything feels sensible. May want to make it a little more open at the ‘top’ so ships can appear to rise out of it. 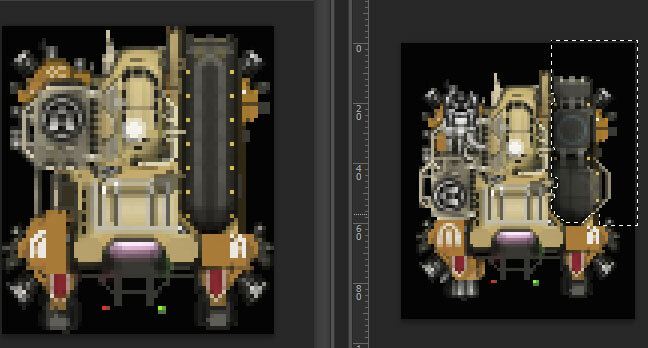 Pen-tool in progress on the left, completed on the right and set to like 50% transparency with a yellow fill. Am I driving pixel art people crazy yet? I’ll say, as ever, the point here is to use every tool at my disposal, there’s no purity in adhering to any style except what ends up producing whatever your goal may be. And I say that now, but I kinda flailed about with stupid layer effects for a bit before diving back in with the pencil tool and doing some selections shaded with airbrush and basically experimenting until it started doing what I wanted. 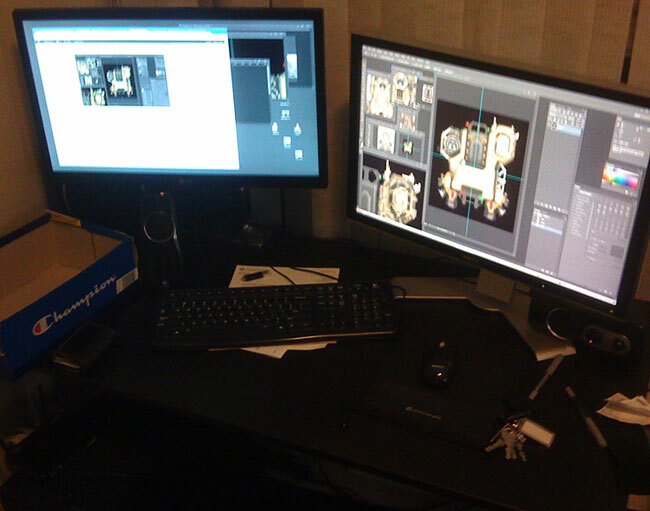 Let’s have a look at the workspace. Bit of a mess, didn’t even name any layers, but I’ll worry about that if anyone else or future-me needs to muck about with them. Hmm. 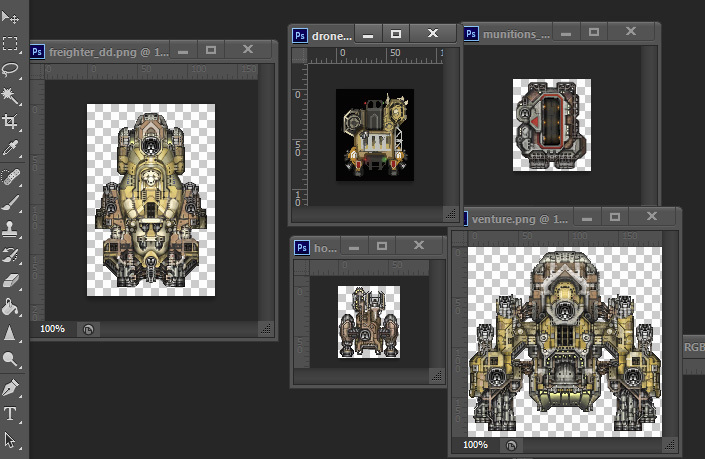 Should put in one of those standard small turret mounts, start defining the important stuff. 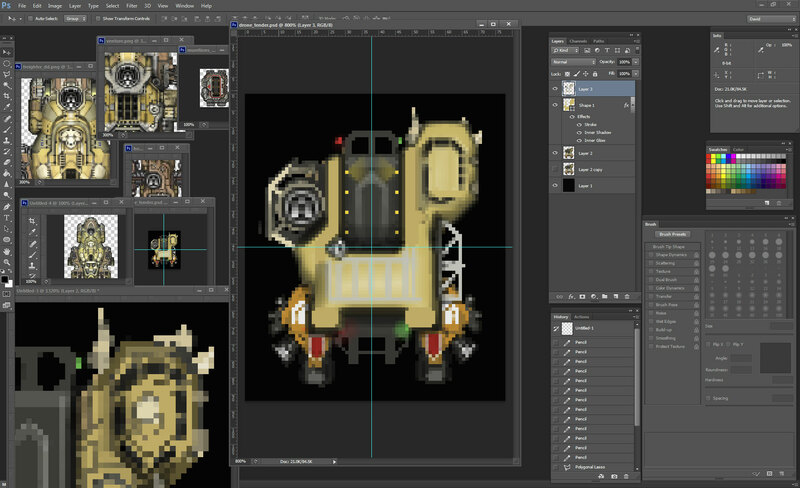 Unfortunately this is looking like a schoolbus or taxi-cab and way out of scale compared to the other Starsector ships, so I’m really really going to have to shift the paint to be a bit more golden-amber-orange, define some armour plates, introduce some more colours, and bring that bridge to be more in-line with other recent ships. The shoebox is a cat trap. If cats love any one thing more than sitting on my keyboard, mouse, and Wacom tablet while I’m trying to work, it’s sitting in boxes. Keep a box by your computer, people! 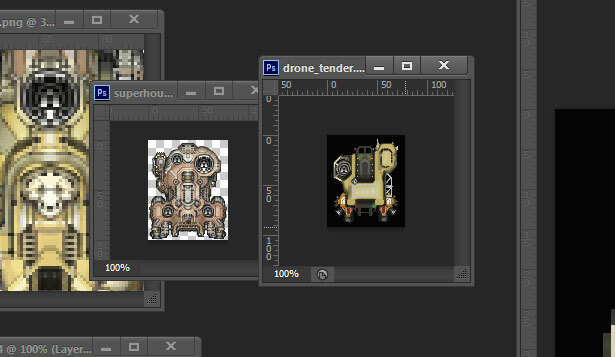 So back to the “drone tender” (working title): Putting this next to the Cerberus (aka the Superhound in my files), the tender has a similar, slightly smaller mass, but is far less elegant. Hmm. 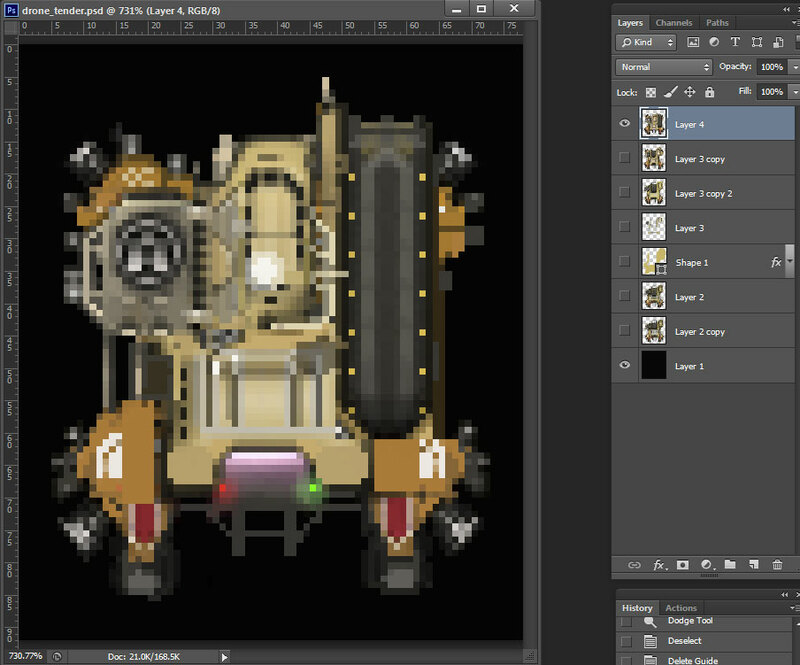 Going to have to think about shifting the visual masses of this ship around. … you know, as long as I’m experimenting with moving the masses around, why not try some more radical changes? 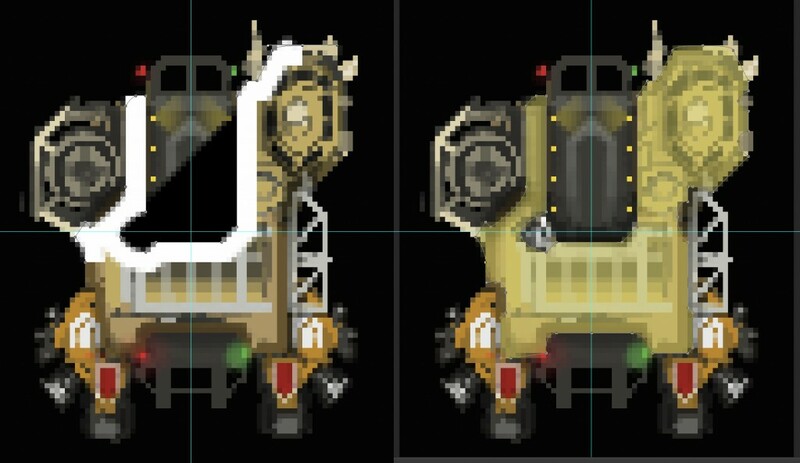 Maybe switch the bridge and flight deck (I mean, the side-mount bridge is kinda obvious on this thing when one considers a bunch of previous ships I’ve done). And maybe try one with the flight deck flipped vertically, for more of a pickup truck look. I’m really liking the side-mounted flightdeck. Feels quite in-line with a utilitarian drone-tender. I … I think I might go for it. Let’s change course, let’s do the whole flight deck on the side like that. Going to need to extend it further down the side of the ship so it’s given proper weight. Filled in all the gaps, did a little light (very light!) dodge/burn to bring out some contrast where contrast was needed. Added a weird pink glow to the back of the ship to have a vastly contrasting colour; may nix those red and green nav lights or put them a little further away somehow ’cause it’s looking like rainbow partyland there. Anyway, now we’re starting to look like something! So how are we doing here? Looking okay; maybe a little too purpose-made feeling with that nice neat flight deck, could be more broken up and jury-rigged. And maybe this looks under-armed with just one turret. We’re not a civilian ship, after all. Say we move the turret back a little and assume it’ll be for defense then put a weird universal hardpoint on the front – it’s not a good idea, especially if we make the OP on this ship really low, but it’ll make someone think they can turn this into an all-around assault carrier. And hey, the desperate pirates/miners/refugees/bandits flying these things will want to aspire to get a good shot in. Perhaps it’d be sensible to put missiles there? And why not upgrade the main drive engines a touch, they look anemic. Well, let’s shuffle these parts around, shall we? Looking much more patchwork, yes. Ripped a hardpoint off the Venture, stuck it on there, gave it some makeshift ducts and tubes, added some rendering to the left engine pod (but will go further with that, I think), broke up the mass of the launch deck and you can see there I have my marquee (hard-edged lasso) going for that shading pass (black, airbrush, ~20%) – it’ll need some lightening up, but can do that along with some deck-light glows. Almost falling into the “filling in the details” mode. Really need to figure out what the back of this ship is doing. Quick sketch? Quick sketch. Ugh, not happy with this. But I’ll show you anyway to show that I make things I’m not happy with sometimes — important to try something and learn that it’s not the way you want to do it! And with that, I shall conclude part 1. Hopefully this has given you a little insight into the creative process and a taste of the technique. Next week we’ll finally this sucker and maybe I’ll get into some closer detail about how I use photoshop to draw this stuff. 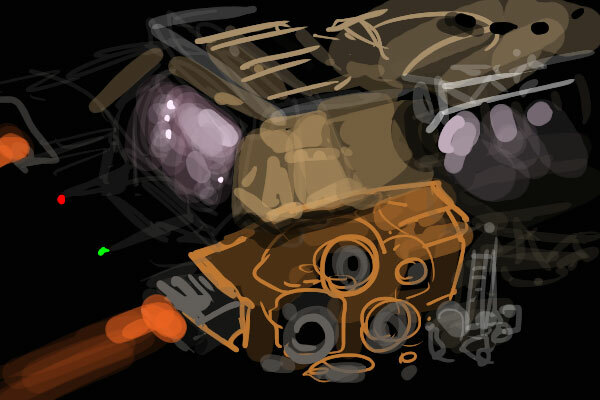 Or continue on to Let Me Draw You A Starsector Ship, Part 2. This entry was posted on Friday, May 16th, 2014 at 2:08 pm	and is filed under Art, Development. You can follow any responses to this entry through the RSS 2.0 feed. Both comments and pings are currently closed.